​The Japanese Chin is a toy breed, kept solely as a companion. Once a lapdog for nobility and Samurai they were illegal for commoners to own and stealing one meant death. Japanese legend says they were fed rice and sake to remain small. 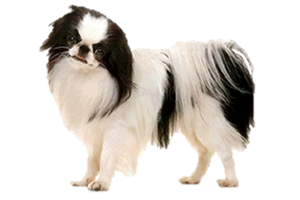 The history of the Japanese Chin is unknown. They are an ancient breed, documented in Japan for over 1000 years and appearing on pottery, silks and temple walls. The most likely theory is that they came from China although the timeline is debated. Some state them arriving as early as the 6th century (brought by Buddhist monks) or as late as the 10th century (gifted by Chinese rulers). It may be that their ancestor is the extinct Happa Dog, which was basically a short coated Pekingese. Some have suggested that the Pug, Pekingese, and Tibetan Spaniel all share the same rootstock with the Japanese Chin through the Happa Dog. Originally each of the feudal houses in Japan had their own line of Chins. This created a wide variety of colors and sizes. During the first half of the 20th century three distinct types still existed, the Kobe (large with a feathery tail), Yamato (medium with brown patches) and Edo (small). After WWII their numbers were so few that the varieties were combined and dogs from outside of the country had to be imported to strengthen the bloodline. Is the Japanese Chin Right for You?